For someone who, by his own words, speaks to God for daily confirmation of his “duty” to expunge evils (axial and otherwise) and “change the world,” The Boosh exhibits perhaps the worst presidential disdain for his creator’s most magnificent creation-the natural environment that gives us life and sustenance. Of course, when playing to the cheap seats in the choir, or sucking up to one’s contributors at the fund-raisers, mammon trumps every time. This is typical of his sense of self-anointed exceptionalism and messianic destiny. The so-called “compassionate conservative” is an “uncompassionate conservationist.” No need for the USA to sign the Kyoto environmental accords, like almost all of the developed nations of the world. Then he so bowdlerizes an environmental report that his own Secretary of the Interior, Christie Todd Whitman, resigns. So now he is even freer to let his corporate cronies pollute the air with his Orwellian titled “Clear Skies [of birds] Initiative,” and generally dismantle years of legislative protections of the environment. So here we are at another Earth Day, and moving in the wrong direction on environmental protection again. The following is a script from a public radio essay I did fourteen years ago. The origins of the environmental movement have been variously dated from Thoreau’s Walden, to Carson’s Silent Spring, to the wreck of the tanker Torrey Canyon off the coast of England. But ironically, it may well be that the landing of astronauts on the moon in 1969—a triumph of technology over the bonds of nature that will come to be regarded as the event which provided the basis for the environmental consciousness. The moon landing not only provided mind-stunning views of our blue-marble planet, it also generated what seems to have become the overarching metaphor of environmentalism: Spaceship Earth, the notion that our spinning capsule of tenuous biosphere is a closed system of physical, biological and chemical processes. It is a metaphor that served to provide the conceptual underpinnings of a more specific benchmark of environmental consciousness, Earth Day 1970. A generation later we are about to observe (“celebrate” would be an inappropriate word) another Earth Day in a more polluted, depleted, and threatened world. The Spaceship Earth metaphor serves as a useful conceptual envelope for raising our consciousness about ecology. But it is also a somewhat misleading notion on at least two grounds. First, and paradoxically, our venture outside the bounds of our planet also affirms that our terra system is not closed; we have already pushed its boundaries to the solar system. And no reasonable person would counter the fact that all life, as we know it, is dependent upon an external source, the sun’s radiation. We are, therefore, actually citizens of a “global village” in a solar nation in the world of the universe. Secondly, and related, the Spaceship Earth metaphor, conveys the idea that the earth is a system that functions in some sort of ecological equilibrium. But while the earth appears to be, at least in the short term of human tenure, a self-regulating, cyclical system, its life has been anything but constant. Rather its chemical composition and physical form has been subject to unceasing changes in gases and solids, shifting planets, heating and cooling, and life forms which have come into and gone out of existence well before the appearance of our kind. We could become the best environmentalists possible, but one monster meteor, or good volcanic hiccup from Mother Nature and the next residents of this planet could be one-celled organisms in the primordial muck. 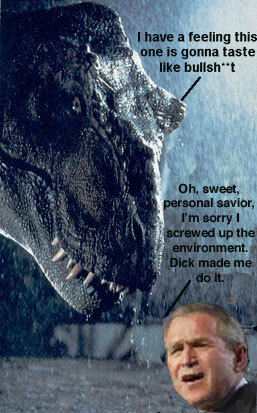 If you don’t believe me, ask a dinosaur. So, does this mean we should forget about Earth Day, crank up the levels of PCBs, dioxins, throw-away cans, level a few more forests, and finish off the whales? Should we live it up in our wasteful ways while we can because there may be no tomorrow? Of course not [unless you’re George Boosh, sucking up to your business cronies]. What it does mean is that earth history did not begin with the evolution of homo sapiens, or our “creation” if you’re inclined to biblical literalism. It also means that we might not be around at the end, if there is such a thing, in spite of how good environmentalists we become. What it does mean is that we have an attitude problem: we have led ourselves to believe that the ultimate purpose of creation is us, and in doing so we have arrogated the planet as our exclusive domain. But we are not the owners of Spaceship Earth, merely its current renters (who are likely to lose our entire cleaning deposit). For 60 million years the renter “terranauts” were the dinosaurs. Somewhere off in the distant future-maybe not too distant-it maybe a life form based not on carbon, as we are, but like our computers, based on silicon, with electron charges coursing in their veins. But for the present the tenant is homo sapiens. What a sorry chapter it will be in the log of Spaceship Earth if we, who have cast its creator in our own image, will not be able to say we did as well as Tyrannosaurus Rex.